Sparkle and sequins for the party season! We had a truly blissful personal shopping session at Westfield London today - so quiet in comparison to the mayhem of Black Friday! We started in Zara at 10am and had the entire place to ourselves - even the staff were smiling! Swirl sequin mini skirt from Topshop. Main range is sold out online (tall and petite still have stock on line) but there's lot's of stock in stores. 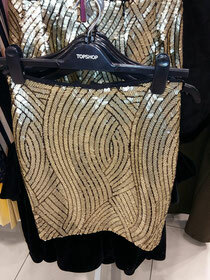 Sequin mini skirt from Topshop discovered today - lots of stock in store! Gold shimmer pleated skirt - tuck in your top and add a leather jacket to edge it up! 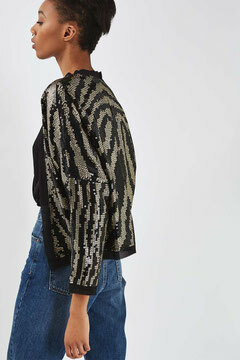 When a top seems too obvious try a sequin jacket instead. Topshop. I really appreciate your hard working because your post really awesome all point of view. Thanks a lot for the post. It has helped me get some nice ideas. I hope I will see some really good result soon.